Micromax Canvas Doodle 4 is now official in India. The company was teasing about the handset since a week and finally it is official. The handset is now available on all major retail stores in India and can be purchased in white color option. 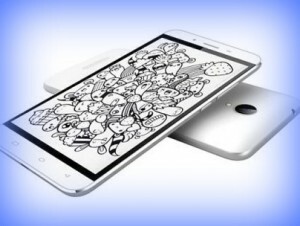 Ahmadabad: Micromax Canvas Doodle 4 comes with 6 inch display and the resolution of it is 540 x 960 pixels. Type of display is IPS. It is powered by 1.3 GHz quad core MediaTek processor which is coupled with 1 GB RAM. Internal storage provided is 8 GB. Storage can be further expanded up to 32 GB via micro SD. It features 8 megapixel primary camera and 2 megapixel front facing camera. The handset runs on Android 5.0 Lollipop operating system. Connectivity features include WiFi, Bluetooth and 3G. Other features are 3.5 mm headphones, FM radio and micro USB charging. There are also ambient light, gravity and proximity sensors. This dual SIM mobile phone comes packed with 3000 mAh battery. Micromax Canvas Doodle 4 comes with several preloaded apps such as Evernote, Snapdeal, Hotstar, Quickr and NewsHunt. Cavnas Doodle 4 is now available on eBay for Rs. 9,199 free shipping is offered. The online retailer claims that nearly 30 handsets are already sold. Payment options are credit card, EMI, debit card and online bank transfer. Cash on delivery is also available. Click here to check the availability. This entry was posted in Buy Gadgets, Launches, Tech on May 30, 2015 by Rakesh.